The Japanese car market wasn't always the technical and engineering Mecca that it is today. Look back to the sixties and the Japanese were learning from their European counterparts. Design, engineering, it was all heavily influenced from the European cars of the day. Back then Jap cars were only seen as the affordable, often cheap imitators. The story is very different today and that role is filled by the Koreans who, just a few years back were offering cheaper versions of what the Japanese had on offer. Over time Korean products have improved drastically and they have firmly established themselves as one of the biggest players in the game. They are here to stay and are constantly creeping closer to becoming the benchmark in the market. What we have here is a Korean challenger to one of our favourite Japanese cars - the Toyota Fortuner. It's no secret that we love our big SUVs and that the Toyota Fortuner is one of our market favourites. 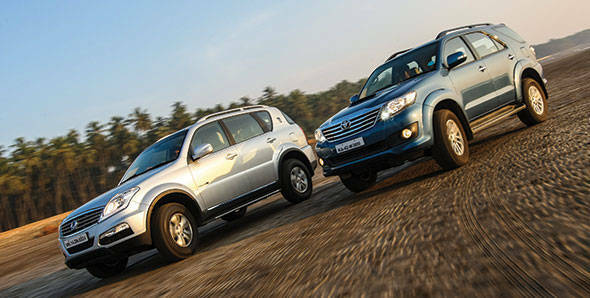 Toyota launched a refreshed version of the Fortuner in January 2012 and while it was largely a cosmetic upgrade the car also came with a new automatic version. Mahindra also had their own SUV (Mahindra acquired SsangYong back in 2011) the SsangYong Rexton on display as well. We drove the car in October 2012 and realised that with a price hovering at around Rs 19.7 lakh and an automatic gearbox it was barking right up the Fortuner's tree. All bark no bite? Let's find out. Spend a few minutes in the Rexton and you realise it's quite the attention magnet. Most stare at it, many ask questions about it and a few even wanted to sit in it. One man actually abandoned his XUV500 at a traffic signal in Worli just to come up and ask me if the car would be a good buy for his wife! But then again the Rexton is a classically good looking SUV with a dominating street presence. The previous models were a bit fugly but the new Rexton got a makeover akin to Sandra Bullock fixing her hair and taking off her glasses in Miss Congeniality. Ugly (and rather muscular) duckling to beauty queen. A chrome grille combined with pulled back clear lens headlamps that pack both LED parking lamps and projector beams make for an imposing front end. The tail gets an interestingly shaped wraparound windscreen and LED clusters in the tail lamps. It's a good looking SUV without too much of the flash of the XUV and I quite like the design. The interiors get smart two tone layout with beige on the upholstery and black along the dashboard. The well laid out centre console makes this a smart and sophisticated looking cabin. It's also rather well thought out for most parts. For example there are three charging points in the front and one in the boot, though none for the middle row. This is a large car and there's plenty of space inside. Middle row leg room is almost as spacious as the Fortuner but there is more space in the third row. The problem is that the third row is very low which means your knees end up at your shoulder level. There's also very little place to slot your feet. Another quirk is that both third row air vents are situated on one side which means the passenger on the left gets no draught of air. Overall finish levels in most areas are good but some panel gaps and quality in certain areas could definitely improve. For example we had the car for a day and something went faulty with the music system wiring and first we lost audio in the right channel. By the end of the day only the rear left channel was working. One of the hinged covers for the power socket also broke with no effort on our part whatsoever. Issues that should be ironed out once the first lot of cars is sold or a sign of things to come? The Fortuner's biggest selling point is its domineering road presence. It's a massive looking vehicle that sends smaller cars scurrying for cover. The updated car has gone for a more Land Cruiser-esque face with new headlamps, grille and bonnet. It looks the part but I'm not a fan of the cheap aftermarket looking clear lens lamps at the rear. The interiors however are a slight let down which feel like a better version of those on the Innova, not something you'd like to see on a Rs 21.9 lakh car and definitely not as easy on the eye as the Rexton's. On the plus side the user interface is better and this is a comfortable large, airy and well built cabin. The driving position makes you feel like the king of the road and build quality is typically Toyota, solid and built to last. The Rexton gets a Mercedes sourced 2.7-litre inline five cylinder engine. It makes a very healthy 184PS and 402Nm in RX7 trim (the six-speed manual gearbox RX5 produces 162PS and 340Nm). The power is harnessed by a 5-speed gearbox and channelled to all four wheels by a full time all wheel drive system. There's no low ratio option here but you can get that on the RX5 with its torque on demand 4WD system. The auto box is one of the most slushy I have ever experienced. Reactions are slow and power delivery is consequently always smooth no matter how hard you stab the throttle. It's great for ambling around town peacefully although you do have to accelerate about two seconds before your actual overtake to be in the right gear at the right time. Despite the slow witted transmission, performance is very brisk  100kmph coming in just 10.1 seconds from a standstill and a top speed at the 180kmph mark. Efficiency takes quite a hit thanks to the gear box and AWD and the Rexton returned an overall figure of 8.6  considerably lower than the Fortuner's 11.8kmpl. But it's not the power or performance that defines this engine, it's the noise and there's plenty of it. Unlike most diesel engines it doesn't have a loud clatter or a grating roar. The problem here is that there's simply too much induction and turbo noise. Driving hard produces a turbulent blend of intake whoosh, the turbo spooling and the dump valve releasing waste air. Even with the windows up driving fast alongside a wall or high divider is akin to driving through a category 5 hurricane. It's far too loud and Mahindra need to take another look at considerably more cabin sound deadening. The 3.0-litre four cylinder engine in the Fortuner is one we particularly like. 171PS of power is plenty and there's 343Nm of shove available from a nice and low 1400rpm right up to 3400rpm after which peak power soon arrives. It gets a 4-speed auto (the Fortuner has now been introduced with a 5-speed auto) that loses out to the Rexton on paper but the box actually does a better job than the Korean's. There's no manual shift option like the Rexton which gets an unusual little toggle button on the side of the gear lever that lets you shift gears with your left thumb. However it almost always has the car in the right cog and reacts far quicker to your throttle inputs as well. Performance leaves nothing to complain with an 11.56 seconds time to the tonne and a top speed of 181.3kmph. The Fortuner gave us a mileage of 16.3kmpl on the highway and 9.6kmpl in the city for an overall figure of a frugal 11.8kmpl. There's no two ways around it. The Rexton is the new segment benchmark when it comes to ride quality. The soft set up means potholes and speed breakers require almost no regard at all. The Rexton just swallows all the imperfections up, transmitting very little of it to the cabin. It handles judder over bumps the best we have come across in any ladder frame chassis SUV. The steering is also the lightest I have ever experienced on a SUV of this size. You can quite literally steer the thing with one finger through traffic. It's very unusual to have such light steering in an SUV and the Fortuner's heavier steering feels more... natural. The natural trade off of all this comfort is high speed dynamics. There are large helpings of body roll and the light steering feels numb and vague. The Rexton feels flighty once speeds cross the 150kmph mark, which it can do with ease. Another issue is the brakes. The pedal has a very long travel and spongy feel and though the brakes bite progressively harder the progression isn't quick enough and ABS kicks in rather early. The car's hefty mass and soft suspension results in quite a bit of nose dive and the overall experience of hard braking isn't very comforting. The Fortuner feels considerably stiffer after driving the Rexton but then most cars would. Ride quality is supple and it handles bad roads with ease, if not with the sheer comfort of the Rexton. The combination of a ladder frame chassis and high ground clearance results in a fair share of body roll, dive and pitch. Nevertheless high speed dynamics are better than the SsangYong's and while both cars are much happier cruising at a brisk pace the Fortuner feels just that much more confident when you're gunning it. The Fortuner was never known for excellent braking performance and while it does have much better initial bit and a more progressive feel the brakes still feel a little wooden when you really slam on them. There's absolutely no discounting the Rexton. It gives you what the Koreans do best - a great looking package that's stuffed with features that very few cars give you at the price, like powered memory driver's seat, auto headlamps, wipers and more. It also costs a whole Rs 2.2 lakh less than the Fortuner. It's an excellent car to be driven around in (save for the engine noise) and if you have a chauffeur and primarily use the car for city driving the Rexton warrants serious consideration. While the Rexton tempts with its design and features at the end of the day the Fortuner is a much better engineered product. It comes with Toyota's brand image and bullet proof reliability. Like most Toyotas it's very well specced. While the design may be a little staid on the inside it gets its fair share of features like a reverse camera and cruise control. It's the better car to drive, is far more efficient, will age better and command a better resale value. And that's just enough to keep the Japs on top of the game. For now.